BentoLunch.net - What's for lunch at our house: Preschool Snack Bento #17 - Grapes, Bunnies & Mommy Overslept! 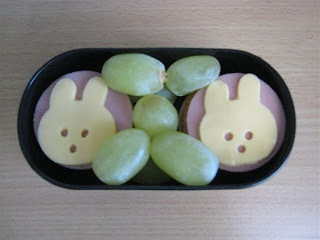 Preschool Snack Bento #17 - Grapes, Bunnies & Mommy Overslept! Wednesday morning, we all overslept, in that no one got up till somewhere between 10 & 11am. Now, granted, Ben does go to preschool at 1pm, but we need to leave our house by 12:30pm. And, we all had to shower, wash hair, dress, eat, etc, and I did not make his bento the night for once. Of course, that happens on the crazy morning of the week. Anyhow, I started delegating the easy tasks and tossed together a quick bento lunch/snack for the boy. Ben has crackers with circle of luncheon meat and bunny faces (dabs of cream cheese hold them together) and green grapes. Nothing complicated, but quick & easy!